Once upon a time, we had a bunch of bananas sitting on our kitchen counter. Since we were getting company on the weekend, my mom got another bunch of bananas to serve with breakfast. Hardly anybody ate any bananas (company or otherwise), so we were left with eight speckled bananas, just sitting there rotting. Briana hates to waste things, so she used four spotted bananas to make banana bread. It tasted good, but it was very, very, very mushy in the middle. So she used the other four bananas, tweaked the recipe, and made banana bars. They’re good. It’s a common misconception that bananas are off limits on the Trim Healthy Mama eating lifestyle (which you can read more about here). While bananas are limited to half a banana at a time in an E setting with protein alongside them to blunt a blood sugar spike, they’re OK to eat. I really enjoy bananas and banana-flavored things, and I don’t have a problem sticking to the 1/2-banana rule, so we keep bananas in the house quite often. Sometimes they don’t get eaten, though, so then I make things with them. Personally, I’ve found that if I don’t eat some banana every once in awhile, my feet start cramping at night. Don’t be afraid of those bananas, y’all! Please do note that because of the bananas included in these, you shouldn’t eat more than two of these banana bars in one sitting (and that would be the majority of your carb source for an E meal). There is some protein in these bars already, but adding some more on the side wouldn’t be a bad idea. If you have trouble hacking alternative sweeteners like stevia, try a recipe like this that uses fruit for part of the sweetness (and check the link below the recipe to see my preferred sweetener – the brand makes all the difference). 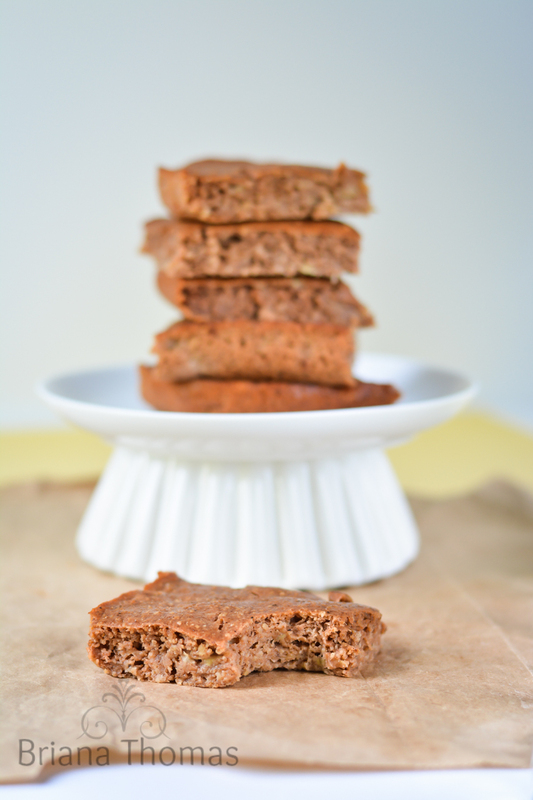 These banana bars taste pretty normal if you ask me – not like diet food. You can add a little cream cheese drizzle on the top if you like; check out my banana bread mini donut recipe for the cream cheese drizzle recipe. You want to use reduced fat cream cheese and keep your fat to under 5 grams per serving so these remain an E for Trim Healthy Mamas. These banana bars are good warm but are pretty soft like a lot of things made with banana tend to be. I prefer them cold, and I think they would be great with ice cream! For my allergy-conscious folks, the only source of dairy in these bars comes from the whey protein powder. You could replace it with a non-dairy protein powder, and another alternative suggested by some of my allergy-friendly blogging buddies is collagen. Need more E dessert ideas? Here ya go! Question of the day: do you get tired of chocolate desserts? Beat wet ingredients together (I used a hand mixer). Add the dry ingredients, baking soda last, and beat again until combined. Pour into a greased 9x13 inch glass pan and shake to smooth the top. Bake at 350 degrees F for about 40 minutes or until a knife inserted in the center comes out cleanly and the middle is not super-soggy (it will be soft). Let the bars sit for a few minutes at least before cutting into 15 pieces. They're good warm but will be very soft. I like them best cold. Store these bars in the refrigerator. The only source of dairy in these bars comes from the whey protein powder. If you replace it with a non-dairy protein powder these would be dairy free. Collagen may work as well. Trim Healthy Mamas, I recommend eating no more than 2 of these bars in a sitting (that would be the majority of your carb source for an E meal). Of course if you just eat one bar, you can have some other carbs along with it. These bars do have some protein of their own, but some additional lean protein wouldn't be a bad idea. THM Pure Stevia Extract Powder, gluten free oat fiber, and whey protein powder can all be purchased from the Trim Healthy Mama online store. I just have regular protein powder, not vanilla. Anything I need to add if I’m just using regular whey isolate protein? Would the bars still work without either the collagen or whey protein powder? Hi Michelle! I haven’t tried that, but since the protein powder is part of the flour, they would be more wet and gooey. You’ll need to replace the protein powder with some extra oat flour and oat fiber, and the bars won’t have as much structure since the protein is missing. 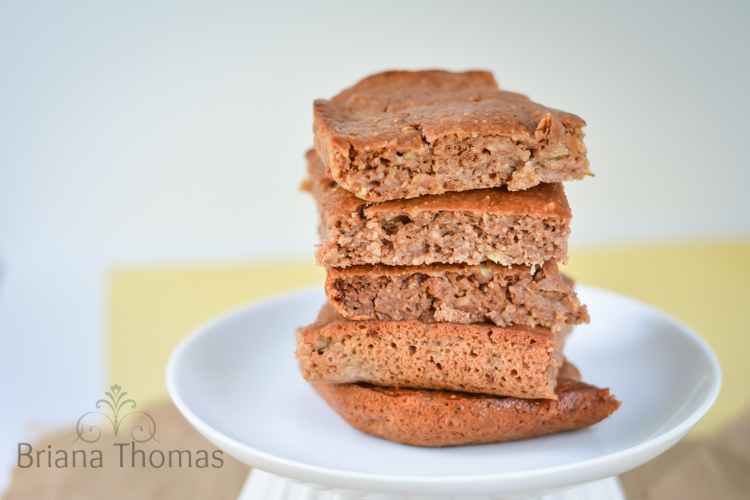 My family loves these banana bars! I make them all the time and they disappear quickly. However, I’m out of protein powder right now, and was hoping to make these. Is there a substitute that would work in place of the protein powder? Thanks! Hi Lisa! I’m afraid I don’t know of a good substitute – except collagen, perhaps? I would probably try using an extra 1/4 c. each of oat fiber and oat flour in place of the protein powder and see what happens. 🙂 They might be a little more dense that way. 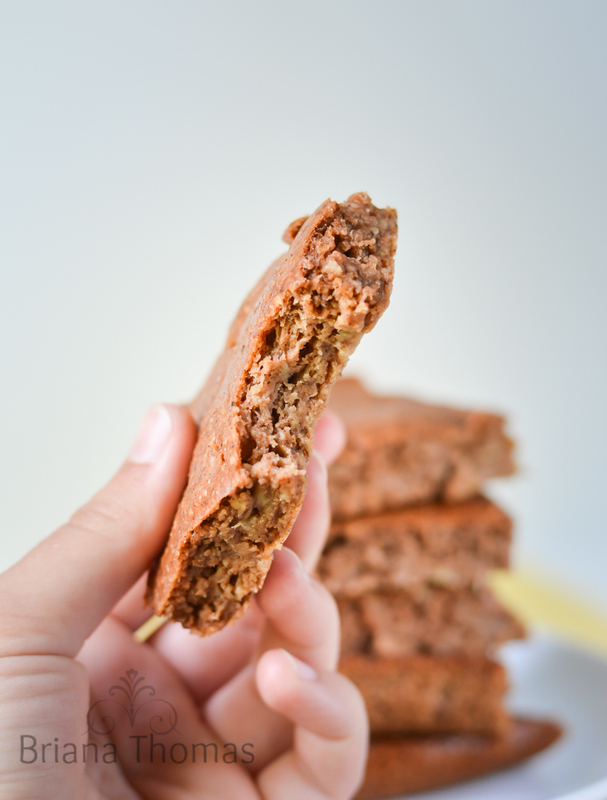 So far I think I have found one other baked goodie recipe that I have actually enjoyed on THM. I loved these…and so did my kids! Go Briana! Where can I find oat fiber? Never seen it in the store. Is there a substitute? As far as I know, you can only order it online. I have provided links below the recipe. You could try substituting another flour like more oat flour, but the texture will be wetter and gummier. If you wanted to sub THM baking blend, what would that trade off be? I don’t believe that any substitution ratios have been given to convert between THM Baking Blend and other flours, so when substituting you’ll just need to do some experimenting and see what looks right. What about a small amount of coconut flour? That might work. Worth a try! Just wondering – can you provide a more specific measurement for the whey protein powder? I don’t have the same brand, and I’m not certain that the scoop is the same size. I guess I can eyeball the consistency of the recipe, but I’d rather not use my (very expensive, to me!) protein powder extravagantly! Most protein powder scoops are similar in size. Unfortunately I am out of state for the summer (I made this recipe before I left) and I don’t have protein powder with me so I can’t measure the scoop. I’m thinking I’ve heard that a scoop is around 1/3 cup (and I think that sounds about right), so I would go with that. Hi Briana! 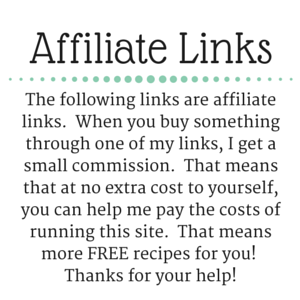 I’ve been coming to your site a lot more lately because of your delicious THM recipes! Thanks so much! :) I had a question though about this recipe….I have problems with high citric acid foods, so I can’t put the lemon juice in, so could I use apple juice instead, or another substitute? It’s my digestive/bladder issues (along with wanting to have more energy with my five little kids) that got me going on THM and I feel great! I’ve been on it since last fall and have lost about 25 pounds. :) However, I have to leave out tomatoes, lemons, most berries, and other high acidic foods to avoid problems with my bladder. So, although THM is wonderful, I still have to tweak things here and there. So, what do you think is a good alternative to lemon juice that I can have to substitute in recipes when it calls for it? :) Thanks for your help! The lemon juice is meant to activate the baking soda, so I’m not really sure how you would do that without another acid. Maybe try replacing it with plain yogurt? The soda might not work quite as well, so if you find that to be a problem, maybe you could mess around with substituting baking powder instead. Congratulations on your new healthy lifestyle! Thought I’d chime in with a suggestion. Can your body handle baking powder? Baking powder already has a dry acidic base added to it and you can sub it for baking soda. Not sure if that would still be a problem for you. You would have to add around 3tsp to be equal with the 1.5 tsp of baking soda. This is exactly my kind of healthy and delicious treat, either for breakfast, or post workout snack. Can’t wait to give this a try!